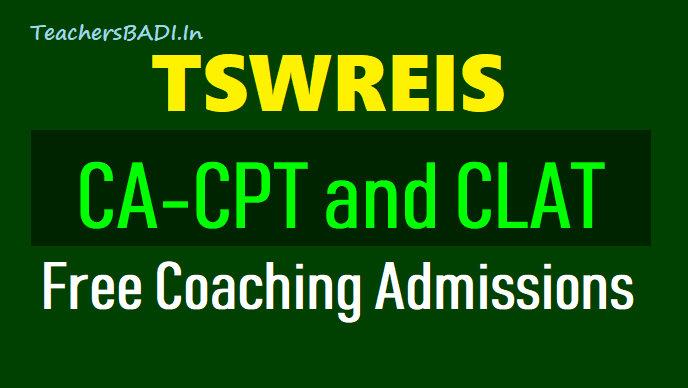 TSWREIS CA-CPT, CLAT Free Coaching Admissions 2018 notification: TSWREIS CLAT Long Term Free Coaching 2018 admissions, TSWREIS CA CPT Long Term Free Coaching 2018 admissions, Tswreis Common Law Admission Test Intensive Long Term Coaching 2018 admissions, Tswreis CA CPT Long Term Intensive Free Coaching 2018 admissions. CA-CPT /CLAT Freecoaching Admisions in TSWREIS institutions 2018: TS Social Welfare CA-CPT /CLAT Free coaching admissions 2018, TS Social Welfare CA-CPT /CLAT Online Application Form, Long term CA-CPT /CLAT Free Coaching Admissions Application Form. Telangana Social Welfare Residential Educational Institutions Society(TSWREIS) has published the Long Term Intensive Coaching 2018 notification for CA-CPT /CLAT 2019 and applications are invited from Boys and Girls for admissions into Long term coaching for CA-CPT /CLAT 2019 at TSWRS/JC institutions for the academic year 2018-2019. 1. The cost of on-line application for IIT Long term Coaching is Rs.100/- and cost of online application for CLAT Long term Coaching is Rs.100/-. 2. Only students, who belong to SC community, can apply (Latest caste Certificate issued by the Tahasildar concerned has to be produced at the time admission). 3. Only the students who passed IPE in March 2018 are eligible. 4. The applicant should have secured minimum 90% in optional i.e., Maths, Physics and Chemistry in IPE-2018 are eligible for IIT Long term Coaching. 5. The student must have scored minimum 90 Marks and above in TSEAMCET – 2018 (OR) qualified in JEE (Mains) 2018 (OR) selected for preparatory seat in JEE Advance for Long term IIT Coaching. 6. For CLAT, the Candidates passed Intermediate with 70% marks in Arts Group subjects (OR) 80% marks in Science group subjects are eligible. 8. The total number of students intake for Long term IIT Coaching is 40 (Boys) and 40 (Girls) at Gowlidoddi. 9. The total number of students intake for Long term CLAT Coaching is 40 (Boys) and 40 (Girls) at Ibrahimpatnam and Medcahl respectively. 10. For selection to Long term CLAT Coaching shall be on the basis of Marks obtained in the “Aptitude test”. The date and venue of test shall be communicated later through SMS to individual’s phone number given in the application by Candidates. 1. The students will be selected on merit basis i.e., The student must have scored 80 Marks and above in EAMCET 2018 (Conducted by Government of Telangana) (to select under 30% quota). The student must have scored 250 Marks and above in NEET 2018 (to select under 70% quota). So, the students will be selected purely on merit of NEET-2018 and EAMCET-2018 marks i.e., 70 : 30 (70% students will be taken from NEET-2018 marks and 30% students will be taken from EAMCET-2018 marks). The students will be selected purely on merit of NEET-2018 and EAMCET-2018 marks in 70 : 30 ratio (70% students will be taken from NEET-2018 marks and 30% students will be taken from EAMCET-2018 marks). 1. The applicant should submit his/her application through on-line website : www.tswreis.in. 2. On-line application will start from 05.07.2018. 3. Last date for submission of application through on-line is 30.07.2018. 4. Selected candidates will be informed through SMS.